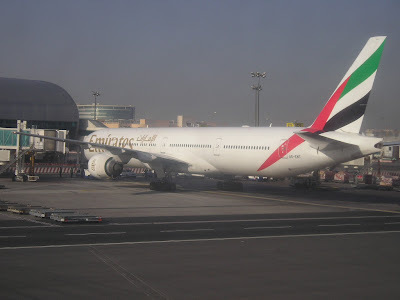 Emirates has announced that it will be launching new daily nonstop flights to Durban, South Africa effective December 1st 2008. A two class configured Airbus A 330-200 will be used for the service and will be the airline's third South African destination after JNB and CPT. By launching these new flights, it will provide EK with a monopoly on offering long haul flights out of DUR to India, Europe and the Far East via its DXB hub which it hopes will lure passengers away from flying long haul to their final destination via JNB or CPT. EK has clearly used some effective lobbying tactics to get rights to fly daily to CPT and DUR all within a few months time. Their exclusive sponsorship rights with the governing body of soccer i.e. FIFA for the upcoming World Cup 2010 in South Africa would have definitely helped pushed its case with the authorities. But on the whole, by being the only airline to offer long haul flights out of DUR (a niche market), EK has a lot to gain with traffic particularly bound via DXB to India, UK and the Far East. Lufthansa will be making many capacity and frequency adjustments for its long haul operations out of its second hub Munich effective immediately. MUC/BOM - to be increased from 3 weekly to daily effective Oct 26th i.e. 3 weekly A 333 + 4 weekly A 343. MUC/SIN - capacity increased to 2 weekly A 346s + 2 weekly A 343s. MUC/DEN - suspended for winter 08-09. MUC/HKG - capacity increased in winter 08-09 to daily A 346s. MUC/LAX - reduced from daily to 5 weekly A 346s. MUC/JFK - capacity increased to daily A 346s from daily A 333s. MUC/BOS - all business configured A 319 seating 48 pax will be used 6 times per week. Besides MUC, LH has also revealed that it will be increasing capacity on its FRA-DTW route by deploying a daily B 747-400 in addition to a daily A 343 which is currently flown with A 333s double daily. Etihad Airways has disclosed that it will be spending US$ 20 billion on buying 50-100 new planes later on this year for which an announcement is likely to be made at the Farnborough Air Show in the summer. EY will be ordering narrow bodied aircraft (most likely A 320s), medium density aircraft (B 777s / A 330s) as well as high density VLAs (A 380s / B 748s). Odds are the aircraft that will be ordered would be A 320s, Airbus A 330-200s (for expansion to Europe, India, Africa and Far East Asia), Boeing 777-200LRs (for nonstop flights expansion to USA, Brazil and Australia) and more A 380s (mainly to compete on a head to head basis with EK). Northwest Airlines has announced that it will be launching new nonstop flights to PEK-Beijing, China from its SEA-Seattle hub. The flight will be flown using an Airbus A 330-200 effective 1st March 2009. United Airlines will be launching 2 new long haul destinations flown nonstop from its IAD-Washington DC Dulles hub from the on set of the Winter 2008-09 timetable. These 2 new routes are IAD-DME (Moscow) and IAD-DXB (Dubai). DME will be flown nonstop daily using a Boeing 767-300ER where as DXB will be also flown nonstop daily using a Boeing 777-200ER. Moscow will be launched from Nov 2nd where as DXB will be flown from Oct 26th. Air Canada will be maintaining flying a daily Boeing 777-300ER on its Montreal-Frankfurt route during the Winter 08-09 season. In addition to YUL-FRA, it will also use its B 773ER on daily YUL-CDG (Paris) flights. With regards to its Asia services, AC will be suspending its YVR-KIX (Osaka) flights from late October onwards. Delta Airlines has increased its flights to ICN-Seoul, South Korea which are flown nonstop from its ATL-Atlanta hub. Flights are now flown 5 times a week using a Boeing 777-200ER from the previous 4 times a week. Kenya Airways will increase the frequency of its service between Dubai and Nairobi from 11 to double daily effective July 1st. The airline has announced the move following continued strong demand as the country's political climate has greatly improved.